Coca-Cola Football Watch Party Kit Sweepstakes – Win 65 inch Smart 4K screen TV! Win 65 inch Smart 4K screen TV & more! Promotion Period, regardless of method or combination of methods of entry. 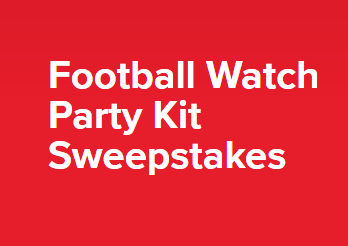 ELIGIBILITY – The Football Watch Party Kit Sweepstakes (the “Promotion”) is open only to legal residents of the 50 U.S. (or D.C.) who are 21 years of age or older at the time of entry. SWEEPSTAKES ENTRY PERIOD – The Promotion begins at 12:00 a.m. Eastern Time (“ET”), September 10, 2018 and ends at 11:59 p.m. ET, October 28, 2018. PRIZES – 1 GRAND PRIZE: A Football Watch Party Kit, consisting of a 65 inch Smart 4K screen television; and a $300 gift certificate to a restaurant of winner’s choice from a list provided by Sponsor, that may be used for catering, terms and conditions apply. Approximate Retail Value (“ARV”): $1,100. 1 FIRST PRIZE: A Football Watch Party Kit, consisting of a 43 inch Smart 4K screen television; and a $150 gift certificate to a restaurant of winner’s choice from a list provided by Sponsor, that may be used for catering, terms and conditions apply. ARV: $650. WINNER’S LIST – For a winner list, visit http://bit.ly/2nYUmkl. The winner list will be posted after winner confirmation is complete.